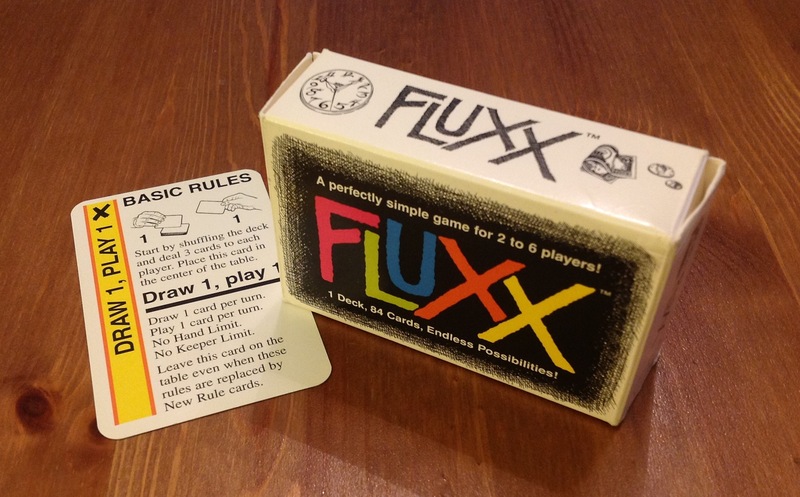 Fluxx is a strange little card game designed by the delightfully named Andrew Looney. No, I’m not joking. The copy I have is a 1998 edition published by Iron Crown and it’s this version I’ll be describing. The current edition is available from Andrew’s own Looney Labs. The game itself comes as a single 84 card deck. The rules are simplicity itself: draw one card then play one card. Not much of a game you might say. However, some of the cards you play will change the number of cards you draw, may (or must) play, can keep in front of you and, importantly, what the victory conditions are. Rules: starting rules and new ones. Playing new ones change the rules immediately. Goals: that define what you need to do to win. The last one to be played overwrites the previous one. Only one is in play at a time. 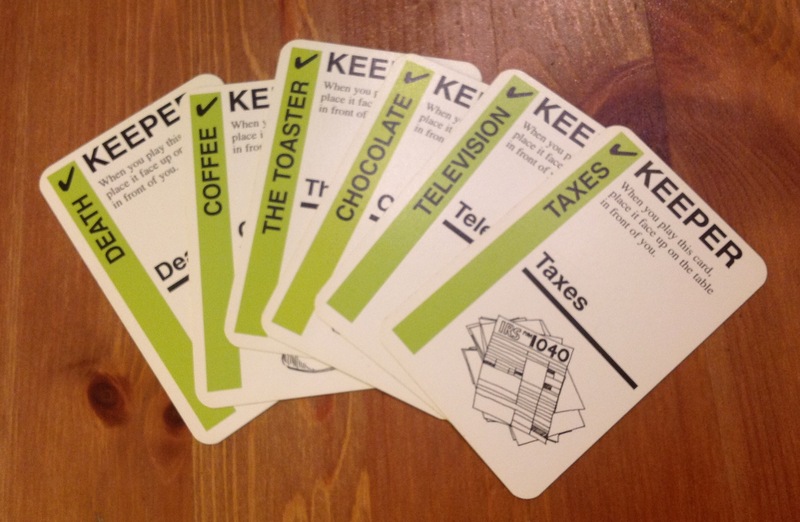 Actions: do whatever they say, such as take a card form the discard pile, trash a new rule, etc. Keepers: are things like chocolate, TV or love. Most of the goals are to do with collecting specified sets of these. You start off with the basic rule cards showing in the centre of the play area. 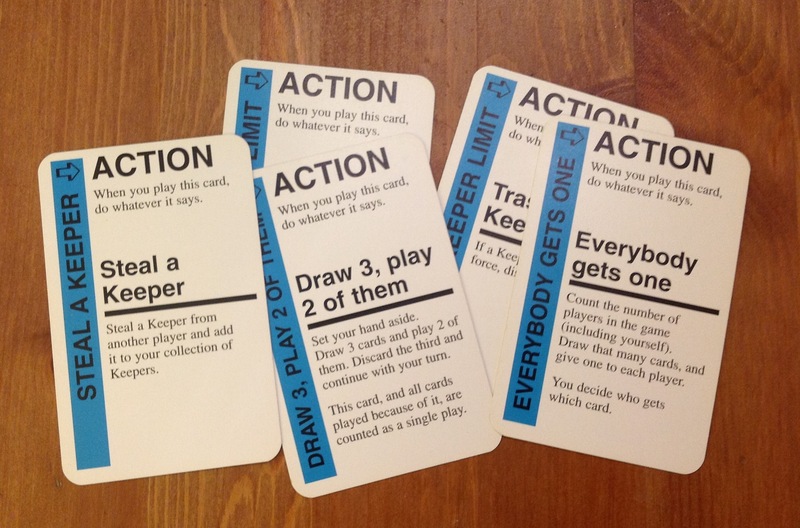 Each player takes turns doing whatever the rules are at that point, say draw one card and play one card. However, many of the cards he plays will change the rules. For example, if he played a draw 2 cards new rule and had only drawn 1 at the start of his turn he would immediately have to draw a second (or he’d be breaking the rules). As new rules are played they overwrite old ones which are discarded. As new goals are played old ones disappear. You go round the players, doing what the rules say when it comes to your go, until someone wins. That, in effect, is the whole game. There’s a bit more to it because you have to follow the instructions on action and goal cards, but that’s about it. Fluxx is, as the name may suggest, immensely random. Not only is there the randomness of card draws, but the rules change constantly making planning almost impossible. This also means that there is nothing much to do while you wait for your turn as you can’t guess what the rules might be when it comes round again. Happily, the game tends to be short (though this is also very variable). Winning the game is often more luck than planning, and it is not uncommon for someone to either win because of other player’s actions, or be placed in a position where they can win because of them (rather than something they’ve done themselves). 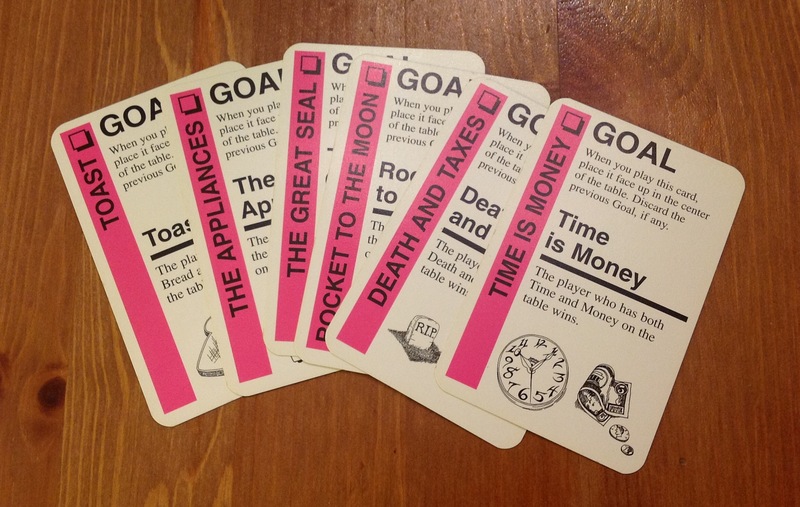 The game can get itself stuck in backwaters where you have no choice about what you play, or perhaps all you can decide is the order you play things (so what the final rule or goal might be). The game, in effect, plays itself some of the time, which isn’t much fun. I’ve even played games where it won while it was busy playing itself. A final gripe might be the lack of theme, or at least the mundanity of what theme there is. The only things mentioned are everyday items and concepts and add little to the game. personally I like a stronger theme, but this is a matter of taste and it’s not something that the game is sold on the back of. 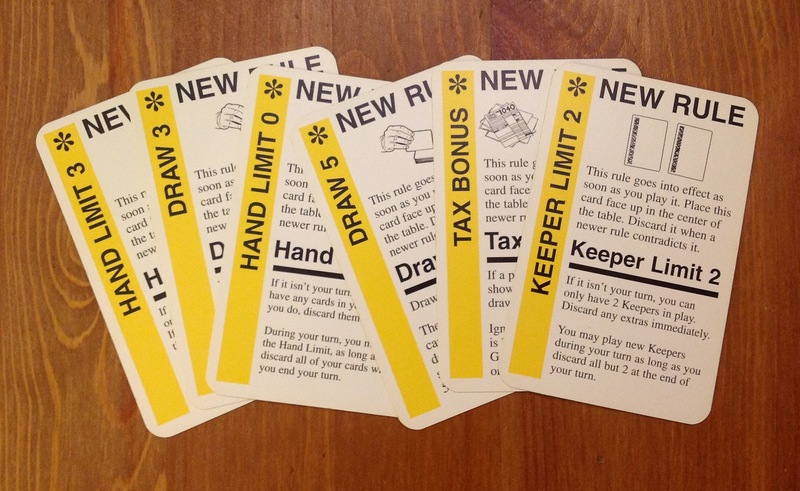 The whole idea of a game whose rules change massively as it progresses is an intriguing one. That is fun to watch, and on the occasions when you can manipulate things to your advantage with skill then it can be very rewarding. These occasions are sadly rare. For all its mutability the game is clear and straightforward to play. As long as the constant change doesn’t throw you, there are few if any rules queries to worry about. In that sense the design is very clean. For me, Fluxx is more of a curiosity and design exercise than it is a real game. I take it out to play with people who haven’t tried it before as a curio, not as a good game. Having played it, folk seldom ask to play it again over other games of similar complexity and speed. Having said that, I do play it with everyone I game with as I think that it’s such a fun idea that every gamer should try it at least once. Not only that, but it’s quick to do so and you can use it as a filler to round out a session. If it was a long-winded game it would have gone on Ebay long since. I expect that I’ve sounded all negative so far, but in reality it is a game that has much to ponder from a designer’s point of view. Fluxx is something that I think any game designer ought to at least have a couple of goes at because it’s such an oddment. In game terms it’s a bit like those buildings with all the plumbing on the outside: it’s workings are all on show. This allows you to examine all manner of assumptions and norms, which it clearly romps all over in its quest for mutability. Personally I always feel like I should be taking more from it in terms of conceptual thinking, and am somehow failing to grasp something fundamental that it’s telling me. Perhaps that’s just me. So even if it fails as a fun game it succeeds in provoking thought and discussion every time, and that on its own is worth the price for me. This has very much the same issues as you describe here, but does have the benefit of an extremely silly sci-fi theme with lots of geeky in-jokes to chuckle over while you play, so it becomes a more interesting game, even if it’s still as random as ever. For a card game with a very similar feel to Fluxx, but a much more tactical experience, check out Hex*Hex from Smirkin’ Dagger http://www.smirkanddagger.com/hexhex.htm. This is essentially a wizards’ drinking game (and works well as a drinking game for us non-wizards), is a lot of fun and has very similar randomnesses to Fluxx but allows for more planning of strategies between plays, and requires one to be constantly watching the game for threats and opportunities. I just wanted to say (since you’re fully into the new format) that I really enjoy reading your reviews. The designer’s perspective is a great add-on (focus?) to the evaluation of the game, taking apart the game both as a “game” and whether it’s fun (and, in addition, whether it’s fun as a game for a designer, specifically). As a writer, it reminds me of reading things which are not so great, but being intensely involved in them from a mechanics perspective. How does it fail? Why does it fail? What can I learn from it? What is it doing that I’ve never even considered doing (and therefore prevented myself from failing, or succeeding, in that specific way)? I especially like to know why and how games fail. Gives me more stuff to think about when improving my own designs. I have a soft spot for time-travelling games, so I’ve tried grabbing one, but it’s pretty hard to find since it came out in 2000. Chrononauts is the only other one of this series of games I have. I haven’t played it for ages. I suppose that says something in itself. Whilst Fluxx actually gets a share of table time being such an oddment, Chrononauts does little that vanilla Fluxx doesn’t in terms of design interest, yet is more complex to explain to a casual player. Not much, but that difference outweighs the draw of the time travel bits. Don’t get me wrong here, I really like the idea of the time travel, I just don’t think he quite pulls it off here. Again though, it’s a tiny game so hasn’t been enough of a problem to wind up on Ebay yet. I usually prefer to get the “plain” version of games, but it sounds like Zombie Fluxx or Star Fluxx might be the way to go. The “Tabletop” crew had a good time playing Star Fluxx, and as an example of what you said, Jake, Wil Wheaton won because of the cards someone else played. I can’t comment on the differences between versions of Fluxx because I’ve not played any of them. My expectation would be that none of them are really much more of my cup of tea than Fluxx, as games, so I won’t be seeking them out. That’s a guess though. I’d be happy to give one a try if I came across it at the club or a con. For the moment though, the vanilla version shows off the design points well enough for my purposes. Hi Jake. A good review but I feel the themed games Delf mentioned above would be more suited to you. We play Star Fluxx every time at the club (after loads of DB, DKH or PP of course) as a way to come down after loads of miniature gaming. Sat in the bar with a choice tipple, it’s a fun, light hearted way to continue gaming – nothing too serious. Anyway, I enjoyed reading your thoughts and hope you give one of the themed versions a go. Also try Zombie Dice for a change of pace. That Will Wheaton has a lot to answer for on Tabletop! I agree that it’s light and fun in a way, but I would pick other light and fun games over it as being better games – and therefore more enjoyable for me. For example, Guillotine, Gloom, Nuclear War, Naval War – all simple and fast fillers. To be honest, when I pull out this stack of fillers for the end of a session I usually put Fluxx on the pile. It’s just that it very rarely gets chosen once everyone has played it once. As I said above, strategies are possible, but far more often than not they will be non-valid by the time your turn arrives again. Try it. Work out a plan for playing your cards immediately after your turn, before the next player changes things. Then tell me how often that plan can actually be carried out, or is worth carrying out after 2,or 3 people have had their turns. mostly it won’t be. It’s a funny one. I wouldn’t have kept it for so many years if I didn’t think there was something in it, but at the same time as recommending it as a thing designers should try I can’t say it’s a great game.